The gateway to the fjords is full of surprises. Founded on an old Viking settlement in 1070, the city of Bergen has a proud history and is famous for its blend of old and new architecture – little wonder it was European City of Culture in 2000. One of Norway’s most enjoyable cities, Bergen is set amid seven hills; while to the south and west islands dot the horizon. 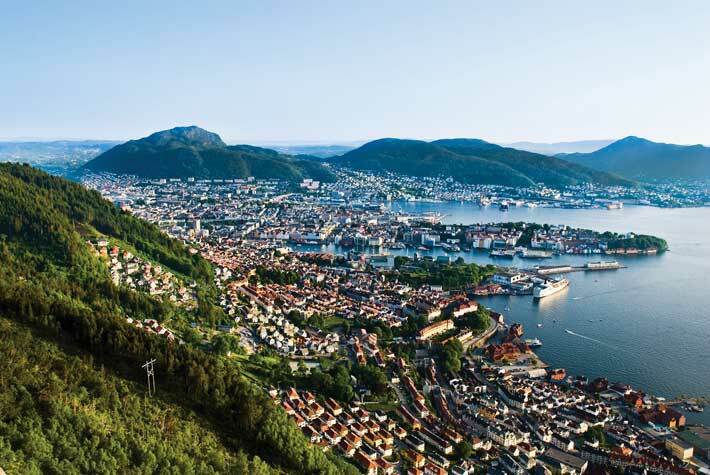 Although Bergen has become one of Norway’s most important cruise ports as the undisputed gateway to the fjords, it remains a laid-back, easy-going town with a firmly nautical air. Fishing may no longer be Bergen’s economic lifeblood, but the bustling main harbour is still very much the focus of life during the day; while at night, bars and clubs attract an arty/boho crowd. 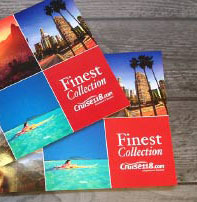 Sadly, most fjords cruise ships sail away in late afternoon so visitors need to content themselves with the many attractions the city has to offer. The Hanseatic Museum is a 300-year-old warehouse that harks back to the cod-liver oil trade, but city-wide there is a jaunty maritime feel. The Fish Market along the Torget in Bergen has been a meeting place for merchants and fishermen since the 1200s. In summer months it is a riot of colour as stalls also sell fruits, vegetables, flowers and handicrafts. 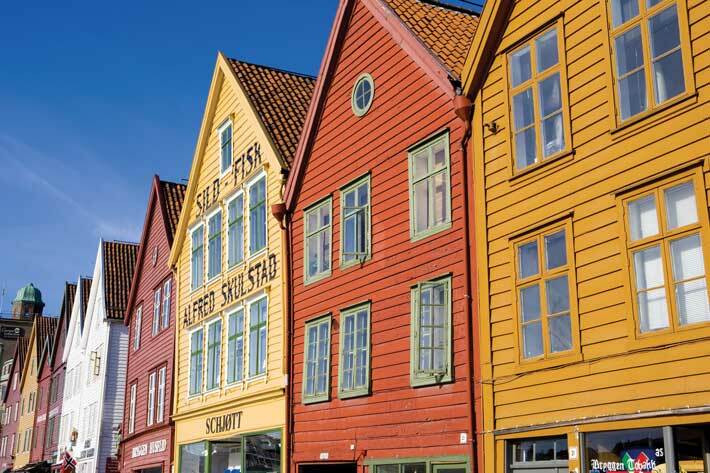 Nearby is Bryggen, the city’s old wharf, which is an exceptional example of a medieval urban area and has been designated a World Heritage Site by UNESCO. Many fires, the last in 1955, ravaged the quaint wooden houses, but today, some 62 buildings remain preserved. The Bryggens Museum is a stunning modern construction built over the remains of the first settlement and allows you to experience life in medieval Bergen. A good tip is to pack layered clothing as well as waterproofs – after all, Bergen is the rain capital of Europe!